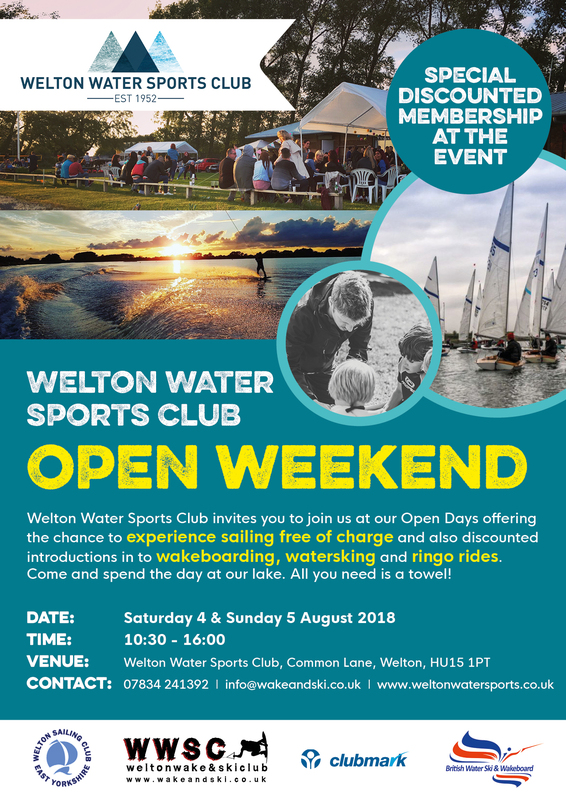 Welton Water Sports Club offers sailing, wakeboarding, waterskiing, windsurfing and other activities to our members and the local community. We are an affiliated club to both the RYA and British Waterski and Wakeboard. We are a not for profit Community Amateur Sports Club, owned and run by the members for the benefit of the members. We are based on Welton Waters in Welton, a village 7 miles to the West of Hull, Yorkshire. The lake is one of the largest lakes in the area, having an area of some 100 acres. We have a modern well equipped clubhouse. There are full changing facilities with hot showers. We cater for all abilities across the various sports that we offer and we own equipment and boast qualified coaches to get beginners out on the water. We encourage the development of children in sport through a seasonal programme which covers sailing, waterskiing and wakeboarding. These courses are run throughout summer by our qualified coaches. Membership to the club as well as guest attendance is handled by the individual sections within the club, Welton Sailing Club and Welton Wake & Ski Club. Please review their websites by clicking on either logo for more information. Both sections offer recreation sports as well competitive events. We also have ties with other local youth groups, and for the last few years we have also hosted the Sailing “Summer Scorcher” in conjunction with East Riding Council. This is a program to give East Riding school children a chances to try new sports during the summer holidays. Our club boasts a long and proud history and dates back to around 1955. The Wake & Ski Club was one of the original affiliated clubs to British Waterski and Wakeboard and is now the oldest affiliated club in the UK. We are a Sport Engand ClubMark accrediated. Clubmark is Sport England’s national accreditation scheme for high quality community sports clubs and stands for higher standards of welfare, equity, coaching and management. We invite you to join us at our open weekend on the 4th & 5th August 2018. Experience Sailing free of charge as well as introductions in to waterskiing and wakeboarding at discounted rates. All you need to do is bring a towel! If you don’t fancy going on the water just enjoy your day beside our lake. The event will run from 10:30am until 4:00pm each day.